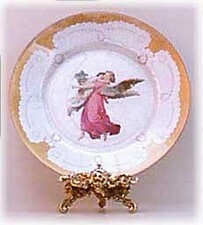 Turn an ordinary clear glass plate into a work of Victorian angel art using the reverse decoupage technique. Select a Victorian angel image for this project. You can find Victorian cut out art in craft stores, but you could also use pictures cut from calendars or magazines providing you take care to cut out the image cleanly and immerse the picture in a bowl of water to relax it before using. Wash the glass plate with soap and water and rinse well. Dry completely and wipe with rubbing alcohol or white vinegar to remove any oil residue from your fingers. Apply an even coat of decoupage medium or craft glue to the entire underside of your plate. Note: If you are using craft glue to decoupage this project, mix the white glue with an equal amount of water and mix together thoroughly before proceeding. Place your cut out image as shown, right side down, at the center of your plate and apply another coat of medium to the back of your cut out, pressing out any air bubbles that may have formed. Immediately place a paper doily, again with right side down, on the top of your cut out and apply another even coat of medium over the entire doily. Press out any air bubbles. Set the plate aside to dry completely. Once the medium is completely dry, dampen a paper towel with window cleaner and use it to wipe away any medium residue that has adhered to the clear glass area only. If you don’t remove this excess glue, the paint finish may be a little foggy when viewing from the right side of the plate. Be careful not to disturb the edges of your doily when removing the glue. Once again, wipe the clear glass area only with alcohol or white vinegar and allow to dry. Apply an even coat of gold paint to the entire underside area of your plate. Allow the paint to dry and apply additional coats as necessary. Two to three coats of paint should be fine. Be sure to allow each coat of paint to dry before applying the next. Although this plate cannot be immersed in water, the top can be wiped clean, so it’s the perfect compliment to any tea service or simply to hang as a decorative accent. Copyright © 1999-2015 Susan Spatone All rights reserved. Published with permission from CraftAtHome.